Bubbay lives in the outback spending his days protecting a herd of goats from dingoes. He sleeps in his swag under the stars and the only person he visits is Mrs Timms for chicken’s eggs. One night, just before Christmas, Bubbay wishes for something he has never had. His friends, the stars hear him and, with the help of a talking Christmas tree, the magical Gubarlee and five desert animals, Bubbay begins a quest to make his dearest wish come true. A hopeful story full of magic, combined with richly textured illustrations of Australian plants and animals, Bubbay offers a glimpse of how the natural and spiritual worlds can intervene by making ordinary lives better. The author, Josie Wowolla Boyle, is a Wonghi woman who was born in the desert of Western Australia. She is an acclaimed storyteller, singer and artist who has been enchanting children and adults of all ages since the 1980s. She has made recordings, worked as an artist-in-residence and featured on ABC’s 5 Nations’ Dreaming stories. Josie is a regular presenter in literature and music festivals across WA, as well as educational institutions. The illustrator, Fern Martins, is an Ngarabul woman from New South Wales. She is an artist of extraordinary range and experience working as a sculptor, printmaker and artist in various mediums. Educated at Sydney Girls High School, Fern completed a Bachelor of Arts at South Australian Art School. She launched her artistic career at the age of 19 with her one-woman sculptural exhibition under the direction of Noel Sheridan. Fern also exhibited her Land Rights prints at the National Gallery. Fern’s activism for Aboriginal Land Rights during the 1980s raised funds for emerging Land Councils. Together with other young Aboriginal urban artists, she started Boomalli, the first Aboriginal Artists Cooperative, in Sydney in 1988. She also assisted the Sydney community to establish art programmes for Aboriginal Cooperatives and lectured at the University of Adelaide. 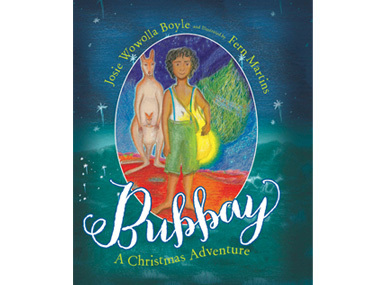 Bubbay: A Christmas Adventure will be available from October 2012 in Australian bookshops and online from Magabala Books (www.magabala.com) for $19.95.